In Caucasus, an ordinary car ride from Adler to Krasnaya Polyana can turn into an unforgettable adventure. Akhun is the highest point in the coastal part of the city. 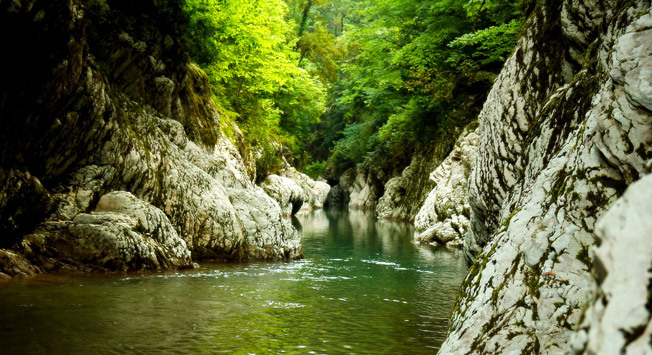 On all its sides, the mountain is covered with dense forest and surrounded by high water - rivers and the Black Sea. Akhun’s height is 663 meters above sea level. In ancient times, lovers of beautiful mountain panoramas climbed to the top by foot along the paths, but were then disappointed, as the tall trees stood in the way of the wonderful views. Everything changed when on the orders of Joseph Stalin an 11 kilometer paved road was paved to Akhun in a serpentine fashion, along which the Soviet leader liked to stroll. Another year later, a tall observation tower made of local natural stone appeared at the peak of the mountain. It has been almost 80 years, but the excursion to Akhun is still one of the most popular ones in Sochi. The Akhun tower is open to tourists all year round. At its foot everybody is offered a taste of home-made wine, tea from a Russian samovar with honey and juicy kebabs. In Sochi, there is not only Stalinist architecture, but also an element of the pre-Ice Age; a subtropical forest. In the village of Hosta a unique monument of nature is preserved; the yew and boxwood tree grove. You'll be surprised at the way boxwood sounds in Russian. Here, even in summer, under the thick crown of century-old trees covered with moss and vines, there is a peculiar greenish shade, in which only ferns can survive out of grass and shrubs. There is a 30 foot yew growing in this grove that is over 1,000 years old, a 400-year old beech and a branchy willow. In Sochi's “Jurassic Park” there are two hiking trails designed: a small and big ring . The first one measures 1800 meters on a concrete walkway with benches and information signs. The second trail is 5 kilometers and it is mostly laid on rocky sites. Another place where you can rest from the city life is the famous Navalischenskoe ravine. The Hosta River hollowed out a beautiful mile-long ravine among the mountain’s dramatic cliffs. There is also a small lake here, which attracts tourists in the summer with its cool water, and in winter with its incredible crystal blue hue. A little further down the canyon a four-meter waterfall has formed. The centuries-old yew and boxwood trees and mighty vines complete the perfect appeasing picture with the moss spread out like a soft carpet. Here there is a café with dolma, lamb chops, grilled meat, fish and local wines. There is also a Russian bathhouse with smoke and a eucalyptus broom. You can also stay the night in a reasonably priced hotel. Right there, in the ravine, there is a place called “Devil’s Gate.” The site has received its menacing name for the river’s unpredictable behavior during heavy rains. In times of heavy rainfall the water rises by three meters, and between the rocks is a narrow cleft where the water gushes through. There, as the Russians say, "the devil himself would not stick his nose in there" The rest of the time, the canyon is peace-loving and picturesque. There is also a lake, a sauna, a dance floor with live music in the restaurant and a hotel. Here you can bring your own food and for a small price the chefs will cook lunch for you. "Bloody Gate" is also a favorite place of the Sochi paintball players. Another one of Sochi’s gems is The Eagle Rocks. Trees and shrubs are growing right out of the white rocks, and from a height of 380 meters, great views of the Black Sea and Mount Akhun are hidden. Old-timers say that before there were eagles nesting here. There is also an interesting legend of the Greek hero Prometheus. It is believed that in this place, not far from the modern Sochi, the Titan was chained to a rock for stealing fire from the gods and giving it to the people. Every day the eagle flew to Prometheus, he pecked out his liver and tore his chest with his claws. The Statue of Prometheus in chains stands on top of the cliff. After having a snack and preparing a supply of water at a local cafe, you can go down to the Agursky falls from the Eagles rocks, which are a beautiful sight even in winter. One after another, 3 large waterfalls appear on the Agoura river. The lower waterfall consists of two cascades – one is 18 meters and the other one is 12 meters high. The height of the medium one is 23 meters, the top one is 21meters. Here is also the picturesque Devil's baptismal font - a small lake where a small, three-meter rapids falls. Located near the city is one of the most extensive cave systems in Russia – the Vorontsov Caves. Their total length is over 11 kilometers. During archeological excavations, scientists have shown that 15-20 thousand years ago, there were primitive people living in the cave. Long before that, the ancient Tethys Ocean spreads out here. In its present form, the Vorontsov Caves are made up of three main parts, connected by narrow passages. The "Prometheus" grotto attracts tourists particularly with its stunning size: 120 meters long and 20 high, on the walls and ceilings there are limestone blocks, frozen rivers, as well as stalactites and stalagmites. Nature has created a hall (called Variety or Chandelier); extraordinary for its beauty and meaning. There is a rocky stage, as well as the 'organ' formed by the cave stone, which makes fanciful sounds when struck. In the center of the room there is a "chandelier" hanging – a result of composite deposits. An ordinary car ride from Adler to Krasnaya Polyana can turn into an unforgettable adventure. Just a few kilometers from the airport is the Trout farm well known around the entire region. You can do a lot of fishing here or buy live fish .The local, incredibly delicious trout with various spices and sauces is prepared in a nearby "Canyon" restaurant , close to the farm. The road follows along the Mzymty river valley; the largest mountainous river in the region. The observation area offers a fantastic view of the Akhtsu valley. They say that it was an inspiration to the designers of the Sochi Central Olympic Stadium. Five kilometers away from the Kepsha village is a small town called "Bear’s corner" , well-known for its mineral springs. On the way, there are apiaries, where in the cold of winter tourists can enjoy mountain honey and warm themselves up with strong alcoholic drinks. Right on the route, the guests will find numerous cafes and restaurants with a Caucasian flavor. Another attraction is the "Maiden's Tears" Waterfall, which flows from a 13 meter-high cliff.